Membership is open to all those interested in machining metal and tinkering with machines. The purpose of the club is to provide a forum for the exchanging of ideas and information. This includes, to a large degree, education in the art of machine tools and practices. There is a severe shortage of written information that a beginning hobbyist can understand and use. This makes an organization such as this even more important. There was no exact count of attendees, but all the seats were occupied. Three guests introduced themselves to the membership. Tom Moore - President, presiding. Tom Moore told of John Oder's offer of free coke and casting sand. $12 for continuing members payable to the club treasurer John Hoff, cash or check made out to him personally. Pay at the next meeting or send him a note in order to make arrangements for payment by US mail. Our speaker was Dr. Larry Russell, self-employed inventor and consultant. He spoke on tackling special problems and needs that others couldn't solve or didn't want to handle. 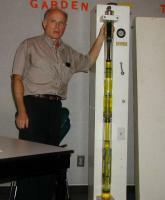 Larry showed a directional drilling device, a hydraulic watch, an aircraft servicing platform, a downhole check valve, and several other items of his inventiveness. 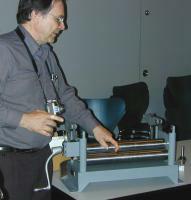 Tom Moore demonstrated the use of edge finders and wigglers. The ball socketed style of wigglers were noted to be very dangerous when they went off vertical due to centrifugal force. 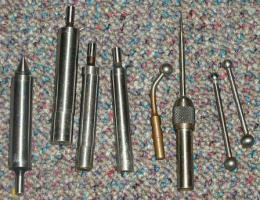 The cone pointed style is for locating center-punch holes. The cylindrical type are accurate but tricky to use as they first jump into and then out of alignment relative to the machine's spindle. Remember to add to or take half the cylinder's diameter off the reading to locate the edge. 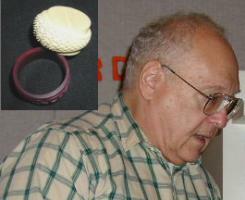 Ed Katz showed a NC generated pattern and wax investment that he used to cast a ring. 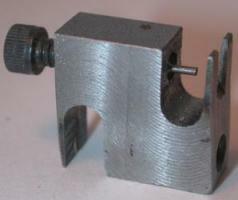 Joe Williams showed a vortex separator he made to catch grinder dust. Dennis Cranston showed his quick change tool post; easy to make and handy. 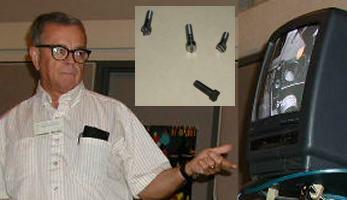 Clarence Palmer showed a differential screw that he uses to finely adjust the tail stock set over on his mini lathe. 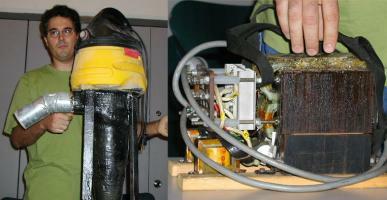 Rod Shampine showed a homemade cyclone separator using a shop vacuum motor and fiberglass cone. He also brought in his made-from-scratch 120V electric welder. Joseph Scott showed a video featuring himself cutting gun screws on a Hardinge turret lathe and a mill. The topic of discussion was the use of Bondo for patterns. Ray Ethridge brought an example of a negative pattern in MDF he used to make a positive completely in Bondo. This material appears to work very well for patterns. 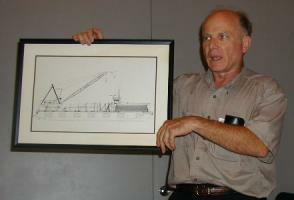 Ray also had an example of the raw material (a big hinge) that he finds at the junk yard to alloy into ZA-12. 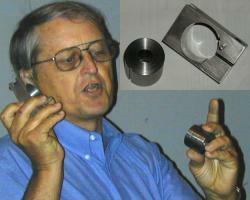 Dennis Cranston showed examples of pewter castings resulting from RTV molds and some ZA-12 castings. In early 1996 John Korman was scanning some back issues of Home Shop Machinist and found a letter to the editor written by Alan May in 1992. In the letter Alan had indicated a need to network with other HSM�s. John took the initiative and called Alan. They talked at some length and decided it would be a good idea to form a metalworking club in Houston. They drafted a letter to be published in Home Shop Machinist which included both Alan and John�s home phone numbers. The letter was published in the March/April 1996 issue of HSM and resulted in an immediate response. John�s phone began to ring and a collection of names of those interested was accumulated. John prepared a newsletter and mailed it to all who had responded. 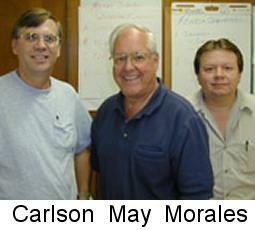 The first meeting was held in May of 1996. John examined the zip codes of those who had responded in order to locate a meeting place. The Oak Forest Library was selected as the centroid of the zip code scatter. The first meeting schedule coincided with a gun show so many of those who had expressed an interest were unable to attend. There were 6 people at the first meeting. 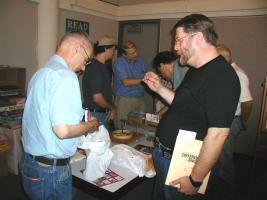 Some of the original six attendees are John Korman, Alan May, Lawney Morales, and George Carlson. Everyone was pleased with the results and agreed it was something worth developing further. John recognized the need for some sort of structure for the group. He imposed on an attorney friend who gave him a copy of the bylaws for a ham radio club. This document was about 25 pages long. John felt it was far in excess of what was appropriate for the group at that time. He extracted the necessary information with the result being the approximately two pages of bylaws under which we currently operate. Once the club was launched, the next challenge was to get the word to other potential members. John designed and photocopied some brochures. Display holders were purchased from an office supply store. 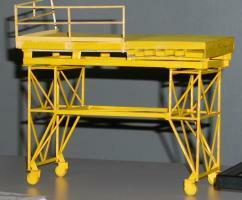 The display holders were delivered to several suppliers where other HSM�s were likely to trade. John learned that the Houston Public Library maintains a list of organizations and managed to get the HMSC included on that list. John also learned that the newspaper prints a local interest insert once per week in which organizations can advertise at no cost. At the second meeting, although there was no formal structure to collect dues, several people contributed money to offset expenses. The initial meeting format was very informal. Usually there were business agenda items to be discussed. The meeting was then opened to discussion and show and tell. The first meeting that I attended was on about November of 1996. I had always wanted a metal lathe and had decided I was not getting any younger so I had better turn loose of some cash. I followed up a newspaper advertisement for a 6� Atlas that John Waits was selling. I bought the lathe and John gave me a copy of the HMSC newsletter to take with me. I attended the next meeting. There were about 12 people at the meeting. The club has steadily grown to the present size of 67 members. In 1999 the number of meeting attendees began to exceed what could be comfortably accommodated at the Oak Forest Library. The meeting location was then changed to the Collier Library. I used a valve handle for the flywheel - could not see them trashed. The engines were a lot of fun to build in my air conditioned shop while it rained everyday here in LA for the past two weeks. 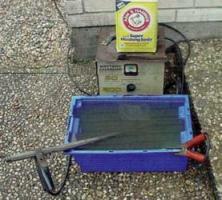 Editor's note: See Joe's air compressor from trash in the July newsletter. I made this puller to remove the pointer hand on dial indicators. The hand is usually pressed onto a stem and it must be extracted in order to remove the face plate and clean or service the indicator's internal rack and gears. The puller has two claws of different thickness in order to accommodate various clearances between the hand and indicator's face plate. The puller body is 0.31 x 0.64 x 0.71 in. The stem screw is fashioned from a #6-32 SHCS (socket head cap screw). The screw's end is turned down to form a pin that pushes against the indicator's stem but clears the inside diameter of the hole in the hand's attachment flange. I have two screws with pin diameters of 0.018 and 0.032 in. Don't forget to put some masking tape under the claw to prevent scratching the paint on the indicator's face plate. During reassembly, you can use the puller's body as a light weight hammer to tap the hand back onto the stem. Editor's note: Don't try to remove a hand by pulling it off with a pliers or prying it up with a screw driver braced against the face plate. 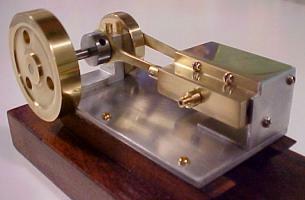 Internally, the stem is connected to a gear and runs on a jeweled bearing. Used properly, this puller places no stress on the inner workings of the indicator's mechanism nor will it scratch or dent the face plate. Here I am derusting one end of a 170 year old gun barrel. I use a solution made from 1 cup of washing soda per 4-5 gallons of water. The negative wire from a 12 volt battery charger is attached to the work (cathode - black clamp) while the positive (anode- red clamp) wire is attached to a submerged copper plate. The anode's surface area should approximately equal that of the work. Twice each day, remove and wash the work with clear water. Rust removal speed depends on the rust depth. Be patient, it may take several days to get down to the metal. Editor's note: As always, put on rubber gloves, wear eye protection, stand on an electrically insulating mat, dress in old clothes, avoid electrical shock by working with one hand in your pocket, and do it outdoors in a well ventilated area. Lastly, to avoid personal injury, have it done professionally. 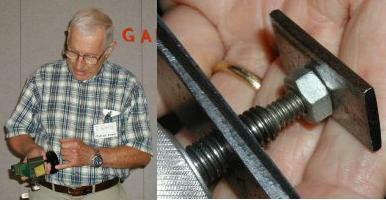 Here is some hard to find, and now antiquated, information about fasteners. Stove bolts! Remember them? Maybe not. Some time ago I reconditioned several base burners, those fancy nickel plated, coal burning, parlor stoves with isinglass windows and fastened together with, you guessed it, stove bolts! Thanks to Joe Scott for putting me on to a 1890 Crerar, Adams & Co. tool catalogue that has the specifications for them olden bolts. With all my projects done and with an itch to be in the shop, it's time to sharpen some tools. To repoint a center or prick punch, I start by placing an O-ring as a stop around the punch's grip. Then I cradle it in a V-block set on the table of the belt sander. Hold the block with two fingers and use a third to gently confine the punch to the V-notch. 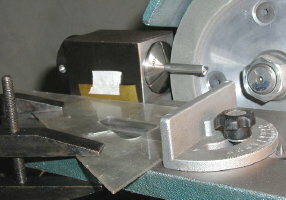 Slide the block along a straight edge, that is clamped to the sander's table, and set at 30 degrees to the belt. Then, rotate the punch with the fingers on your free hand to produce a 60 degree point. I find that the belt sander is less likely to burn a tool's edge compared to a stone grinding wheel. Consider leaving the O-ring permanently on the punch. Then, when it tries to roll off of an inclined surface, it will turn a circle rather than end up on the floor. For those who have those, square shank, non rolling, center punches, you are on your own. For sharpening wood router bits, I use one of those square blocks that accepts a 5C-collet. 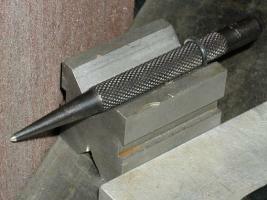 The photo shows a straight two fluted carbide tipped router bit held in a collet. You'll be grinding only on the relief edge, the one that is nearly tangent to the circle of cut. You can test for proper grind angle by coating the cutter's edge with toolmaker's dye and rotating the grinding wheel by hand. When the dye is scratched off of the entire face of the relief edge, the angle is set correctly. A plastic drafting triangle is first used to set the table's miter gauge square to the wheel face. 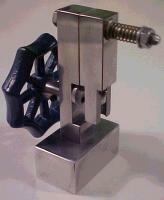 Then, it serves as a guide, clamped to the table, along which I slide the collet block to sharpen the bit's edge. The block is turned over to do the opposite edge. In order to advance the grind a few thousands, I tape a strip of brass shim stock to the block's side. You can tip the block away from the wheel in order to disengage the grind rather than sliding it backward along the plastic triangle. Now, some will claim that I am grinding on the wrong edge. In order to best preserve the cutter's original diameter, only the radial edge should be ground. Well, I don't have the equipment to do that. But, there is an advantage gained by grinding the relief edge. I cherish my bits that have been sharpened several times. Brand new bits, that are supplied right on the fractional inch dimension, cut a dado that is too wide to snuggly fit the thickness of today's plywood sheets. I seems that manufactures have been shrinking the sheet's thickness a few thousands of an inch each year. Well, I guess that's how profits are made! Finally, you'll need a diamond impregnated face wheel (a green silicon carbide wheel is a distant second choice) to sharpen those bits that have carbide inserts. The next meeting will be held on Saturday September 14, 2002 at the Collier Library 6200 Pinemont, Houston, TX at 1:00 p.m. Bring along a work in progress to show.